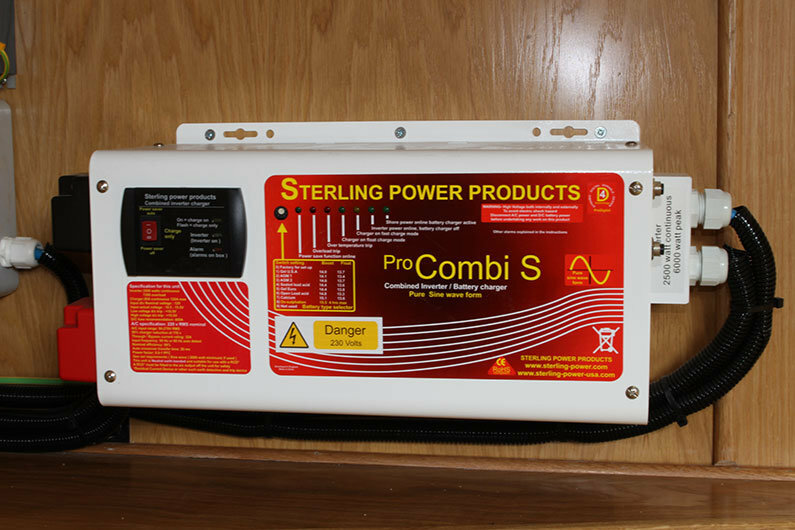 Guide To Narrowboats Inverters | Pure Sine Wave Or Modified Sine Wave Inverter For A Narrow Boat? 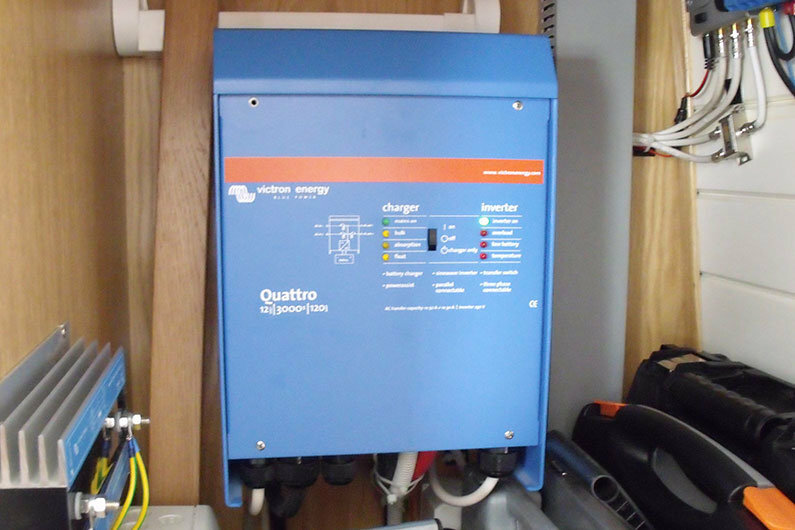 Inverters are an integral part of many narrow boats’ power management systems. They convert the power from a battery to enable household mains appliances to be used without direct connection to the 230volt mains electricity grid. An inverter is simply a device that changes DC direct current voltage to AC alternating current. It enables us to run 230VAC household appliances from the battery storage bank we have on our narrow boats. Inverters can be combined with a battery charger to provide a one box, compact power solution. There are two common types of inverter generally available. They are classified by the type of electricity they output & are know as the pure sine wave inverter and the modified sine wave inverter. You will often find that modified sine wave inverters are less expensive than pure sine wave inverters. This is because pure sine wave inverters use complex electronics to produce an approximation of mains grid power. Is this important? To detemine that, we need basic understanding of how the two types of inverter operate and how this affects some appliances on a narrowboat. You can then make a decision based on the type of equipment you intend to power. The pure sine wave (below) has a curved peak transitioning smoothly into a curved valley. The modified sine wave (left) has more of a stepped platform structure. As we can see there is a “rest” on the central zero line for a few milliseconds. Why is this relevant? Well, some processors in sensitive equipment count the zero crosses & use this to measure time.The prolonged rest of a modified sine wave could be interpreted by the processor as multiple zero crosses & therefore upset the delicate calibration of some electronic devices. Motors that have a speed control, such as washing machines, and light dimmers contain sensitive components that can be upset by the use of modified sine wave inverters. If you are installing a washing machine, it is good practice to go for the pure sine wave unit on your narrowboat. That said, a modified sine wave inverter is quite capable of running a wide variety of loads produced by household equipment and tend to be less expensive than pure sine wave units. In some cases, when running low power equipment such as computers or televisions for long periods of time, it is even preferable to run equipment from a modified sine wave inverter. They tend to require lower power to run themselves and in these cases are more power efficient. As always when specifying equipment, please take the advice of your local specialist marine electrician, BSS examiner or surveyor. A sine wave is a mathematical curve that describes an oscillation. Why is it important to know this? Well, the sine wave is the usual waveform of AC mains current. 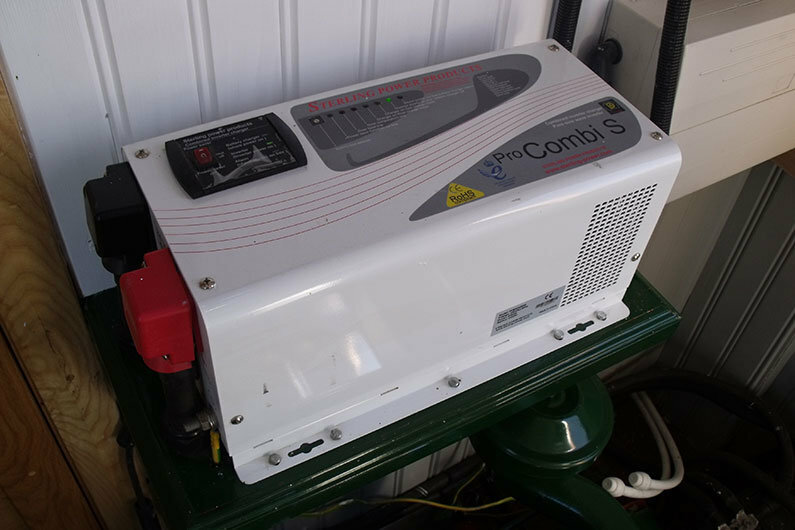 As the 230VAC appliances and accessories we use on our narrow boats are designed to run on pure sine wave electricity supply, it makes sense that when converting DC to AC, that conversion produces pure sine wave output. Appliances with motors will start easier, run cooler and with less electrical interference. Sensitive equipment with internal electronic timers can potentially be damaged if they are not run on pure sine wave AC & it is advisable to specify one of these units if you intend to run a washing machine. Just to confuse us, you may find inverters are rated in terms of their power in two ways. The ratings advertised by manufacturers my be either in WATTS or VOLT-AMPERES. Watts (W) are the power handling capacity of the units whereas volt-amperes (VA) is an indication of the maximum permissible current. We need to size the inverter on a narrowboat to be able to power the biggest appliance and as appliances are rated by watts, it makes sense to size/buy your inverter by using its W figure rather than the manufacturers quoted VA.
For example, you may see an inverter rated at 3000VA but the unit may only be able to power appliances rated up to 2,500W continuously. Note that 1000W is a kilowatt abbreviated to kW. Always look at the technical specifications supplied by the manufacturers before making your selection. We did a power audit for our 12VDC appliances to determine the basic battery capacity to effectively run our very simple DC only system. When designing our AC circuit requirements we do the same again & complete another power audit. This time our appliance audit will not only give us an idea of the maximum size of inverter we need, it will also give us additional information we will need to consider when specifying our battery bank. Oh, and the audit will also give us food for thought when considering how we are going to put back into the battery bank all that lovely power we’ve taken out to run our AC appliances. It’s worth getting into the mindset here that we are not dealing with a common domestic set-up with seemingly unlimited power at the flick of a switch. Marine systems have evolved dramatically over the last few years in order to try and keep pace with our power hungry lifestyles. Never-the-less, whilst most requirements can now be accommodated on a narrow boat, there will always be some sort of compromise when loading up an electrical system with AC appliances. Additionally, we must work out the amp/hour draw on the battery bank when using AC appliances to ensure the battery size and inverter size are matched. For example, a washing machine with a 2.5kW would not be able to be powered by a 200W inverter coupled with a 50amp battery. In addition, whilst being realistic, we need to be mindful that more than one appliance may be required at the same time. When we remember that the optimum battery size is around 450amps, it is not difficult to very quickly run out of power when running AC appliances through an inverter. If you are purchasing a sailaway narrowboat or widebeam you need to consider carefully your power needs to make an informed choice of inverter. If you are buying a fully fitted boat, speak to your canal boat builder to see what they supply as standard to see if this is sufficient for your needs. It would not be ideal, never mind expensive, to have to change your inverter shortly after moving on-board when you discover it does not meet your power needs! Making these decisions at the planning stage can save stress and money down the line.